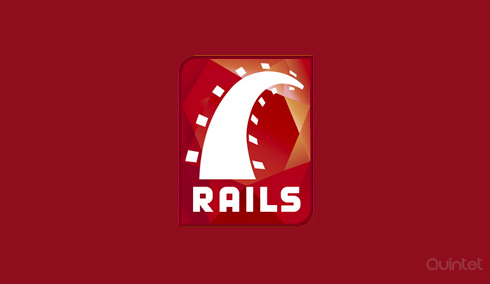 Ruby on Rails is an open source framework to develop web solutions, which is written in Ruby. Abbreviated as RoR, Ruby on Rails use Model-View-Controller(MVC) way to organize the projects developed. Active Record for handling database, comprehensive AJAX library are the other advantages. Convention over configuration, Quick turn-around time and Don’t repeat yourself (DRY) strategies form the major underlying principles of RoR. Availability of plenty of gems, for use by developers, is one of the strengths of Ruby on Rails. Being a full-stack framework it works as an exceptionally potent tool in development. The well written indentation coding will create tidy maintainable quality source code which delivers bug free rich web applications. The main objective of Ruby on Rails is to develop web solutions quickly without much hassle for the developer to worry about the core backend. We at Quintet have vast experience in Agile Web development using RoR and thus can deliver your app in the requested time frame. Customer preferences are gathered and the workload is organized and distributed over a series of short development cycles. Each of the steps, from initial phase to product delivery, is subjected to careful evaluation by our development team. This makes us adaptive to varying client requirements. At the same time, we will be all ears to reviews and feedbacks so as to create an open communication to ensure all the requirements are met for the product. We have an excellent group of programmers and Layout/UI designers, capable of creating beautiful front-end designs and reliable backend logic. For realizing your innovative thoughts and product ideas, our full time RoR developers here at Quintet Solutions are ready for action. You will be able to directly contact your team and prioritize your requirements in the way you want them and get the tasks done. Every business has varying requirements, so an existing pre packaged application may not be an effective solution for you. Customization of application will be a must in such a scenario, to solve multiple issues and adding advanced features to simplify your effort and save time. We help you to design and create custom applications that functions exactly the way you want them to. Vast experience in customization and agile methodology helps our team to study your requirements, analyse the marketing scope and design the final product. Your business process as well as confidential informations will be secure under NDA. The final result will be an efficient application for simplifying your processes and helping your business growth. We offer development of E-commerce sites with RoR in a flexible and cost-effective manner. There are situations in which you don’t want to lose current market and customers and require a E-Commerce solution within a very short timespan. We are here to help you overcome this by customizing and intensifying, full-featured and open source E-Commerce solutions which are readily available, so that the product is launched faster. But If you want to build a private and custom E-Commerce application, our experienced and dedicated group of programmers can guide you in an agile manner from the start to the product launch keeping your business processes unaltered. We can also help you in developing high-end features found in popular E-Commerce suites and integrating the same with your application. There are plenty of open source and user friendly content management system empowered by Ruby. But there might be situations like you may need to extend the functionalities, create new themes for a better look and feel, integrate a content management system to an existing rails project, etc. Our developers can provide apt solutions and support for the solutions delivered. For creating a blogging system from the scratch, a wide variety of tools and technology other than RoR are already available. But its easier to add a blogging system to an existing rails application. At some point of building up your business, you may like to add custom plug-and-play functionalities to your system and also like to reuse them for future projects. For extending the performance and usage of your app, we can help you in developing widgets and blogging systems.